During the 2002 war, the CIA distributed thousands of 'imitation bank note' leaflets in Afghanistan and Pakistan, offering rewards of thousands of dollars for the capture of Taliban or al-Quaida fighters. One such leaflet was inscribed with the message "get wealth and power beyond your dreams, help the anti-Taliban forces rid Afghanistan of murderers and terrorists". The rewards on the imitation bank notes were equivalent to $4,285, although detainees testified during military tribunals that bounties ranged from $3,000 to $25,000. An academic paper by Mark Denbeaux of Seton Hall University concluded that 86% of the detainees in Guantanamo Bay were captured by Pakistani or Northern Alliance tribesmen at a time when the US offered these large bounties for the capture of suspected enemies. Only 5% of detainees were actually captured by US forces. Human rights organisations have voiced concerns that the offer of large rewards in a country blighted by poverty will mostly result in the kidnap of vulnerable and innocent people who would be 'easy pickings' for unscrupulous tribesmen and Northern Alliance members. This analysis is consistent with the stories of many detainees, most notably the "Tipton 3" from the West Midlands, who have maintained that they were kidnapped in Afghanistan whilst travelling back to Pakistan for a wedding. According to the US government's official figures, 55% of the detainees are determined to not have committed any hostile acts against the US or its allies. "Sometimes, we just didn't get the right folks," said Brig. Gen. Jay Hood, Guantanamo's current commander. Closer inspection of evidence cited as 'proof' that individuals were "enemy combatants" reveals that this included association with an unnamed individual, attending the 'wrong' guest house, possession of a rifle, and ownership of a Casio watch! In Afghanistan, where gun culture is rife, possession of a firearm is widely thought not to distinguish a peaceful civilian from a fighter. US intelligence officials have labeled the Casio F91W "the watch of choice for terrorists", despite being owned by millions of people worldwide. A perusal of detainee records demonstrates that such 'evidence' is often the sole reason for the continued detention of an individual, with no evidence of any crime ever being committed. Donald Rumsfield's assertion that the Guantanamo detainees are "the worst of the worst" is not only groundless, it tacitly implies they are not worthy or deserving of a fair trial, a right which all civilised peoples can agree on. Human rights organisations have likened the kidnap of so-called "enemy combatants" to the slave trade, only people are kidnapped, bought, sold, and tortured to satisfy a fearful population that 'something is being done' about 'terrorism'; that 'justice' is prevailing. The end result, however, is the loss of the very values that are supposedly being defended by the 'war on terror'. Prisoners and ex-detainees in Guantanamo have been held in extreme solitary confinement for periods exceeding a year; deprived of sleep for days and weeks; exposed to prolonged temperature extremes; and subjected to severe sensory deprivation. Photos and video material shows detainees shackled and hooded. Some also show beating, kicking, punching, stripping and the forced shaving of beards, hair and eyebrows by the small scale riot squad when detainees resisted. 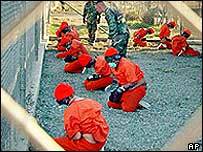 Interrogation techniques approved for use at Guantanamo include isolation for up to 30 days, 28-hour interrogations, extreme and prolonged stress positions, such as short-shackling, sleep deprivation, sensory assaults, forced deprivation of clothing, hooding, and the use of dogs. The Tipton Three have made a statement after their release saying that, during their time in prison, they saw a mentally ill inmate being beaten, and another man left brain-damaged after a beating by soldiers as punishment for attempting suicide. In early 2007, human rights lawyers Brent Mickum and Clive Stafford Smith released a statement saying that their client Bisher al-Rawi, one of the 9 remaining British resident detainees, is suffering from Secure Housing Unit Psychosis, a condition noted to affect prisoners on death row. Al-Rawi is an Iraqi who fled Saddam Hussein's dictatorship as a child and settled in Britain. Alone of his family, he retained citizenship of Iraq in the hope that one day he would be able to claim the family's abandoned property. He has never been charged. Mickum has stated that "Bisher's treatment is designed to achieve a single objective: to make him lose his mind." Human rights groups have noted that releasing tortured prisoners who are clearly innocent could further undermine the US government's legitimacy in the so-called 'war on terror', thus there is a distinct incentive to ensure that prisoners are either never released or, at least, reduced to a state where they can never tell of the atrocities committed against them. 3 men died at Guantanamo Bay in June 2006. The US military and government were quick to label these deaths as 'suicides'. However, former Guantanamo detainees, including 9 British citizens, claim that they were, almost certainly, killings caused by excessive force used by US guards there. The US administration described the deaths as "an act of asymmetrical warfare" and a "PR stunt" by al-Qaeda operatives being held at Guantanamo. This is possibly the most offensive and insensitive thing the military has said to date. "There is no way to commit suicide at Guantanamo," said Mamdouh Habib, former Guantanamo prisoner. "We were not only under constant surveillance, but there were no points in the cells to hang anything, let alone a person." According to Reprieve, a UK-based charity that represents 30 Guantanamo detainees, their clients were detained and tortured in other countries as well, including CIA 'secret prisons' in Europe, prior to arriving in Guantanamo. These include Morocco, Egypt, Jordan and Afghanistan. The extent to which governments other than the US are complicit in so-called extra-ordinary rendition is shocking. Conservative estimates made by Congressional Quarterly in August put the figure of extra-judicial detainees at 14,000. Of these, only 500 were in Guantanamo. Another 300 were said to be held in Bagram airforce base, which is Guantanamo's lesser-known twin in Afghanistan, but where the conditions are far worse. Detainees reportedly receive no legal representation and the press have no access. CQ also estimated that there were 12,000 extra-judicial prisoners held in Iraq (that is, held without trial or access to their families) and about 100 held in 'other places'.